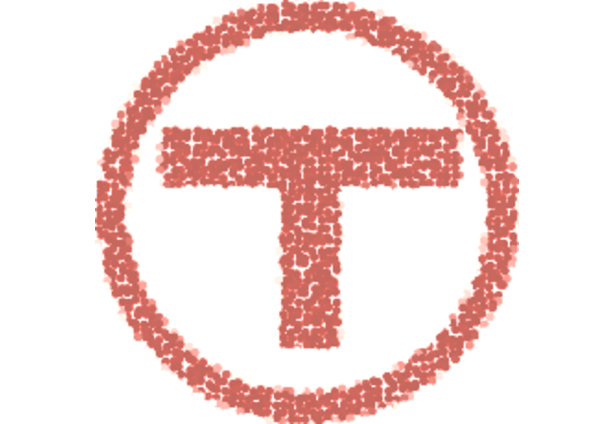 Want to play MBTA Bingo? 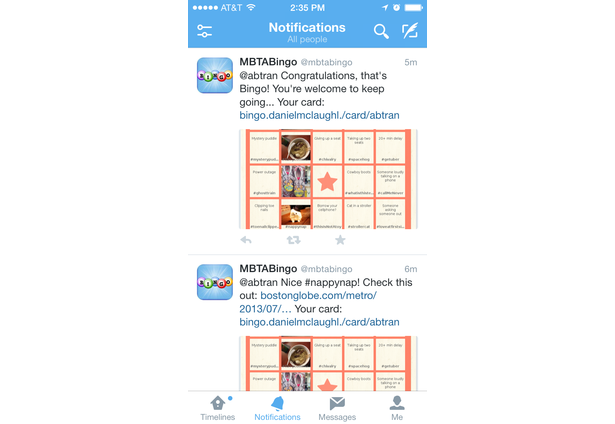 Ask for a card via Twitter and the @MBTABingo bot will send you a custom randomized card with 24 squares like "someone sleeping on the train" or "another Red Line delay". 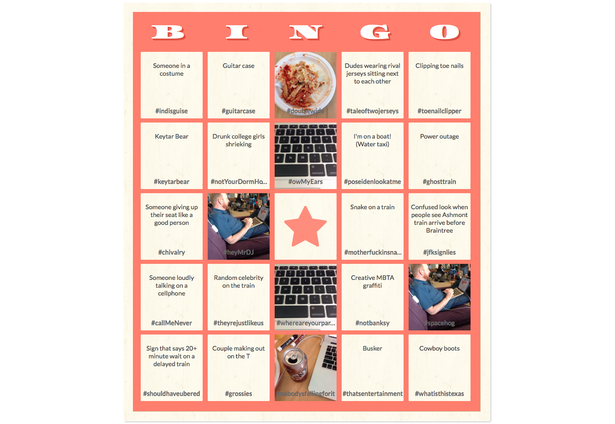 Take a photo, tweet it at @MBTABingo with the matching hashtag (like #RedLineDelays) and then @MBTABingo will send back your updated card with that square filled in with your photo. Or you can check the embedded link to see a card you can bookmark and share. The Bingo Bot will also send a follow-up Tweet with a related link to a recent news article. 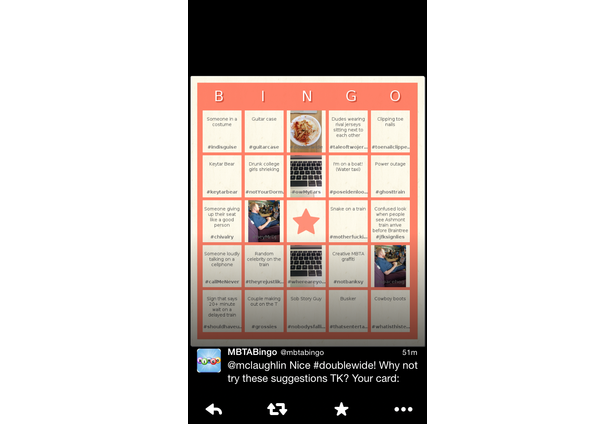 Get five photos in a row, horizontally, vertically, or diagonally, and you get Bingo! Share it with your friends, or check your status on the leaderboard. News organizations used to be able to get user-submitted photos just by asking for it on their websites. But increasingly, they've had to turn to social media streams like Twitter and Instagram as mobile use increases and use of digital cameras decline. People want to share their photos and have hashtag conversations with their friends and followers. News organizations are being left out. 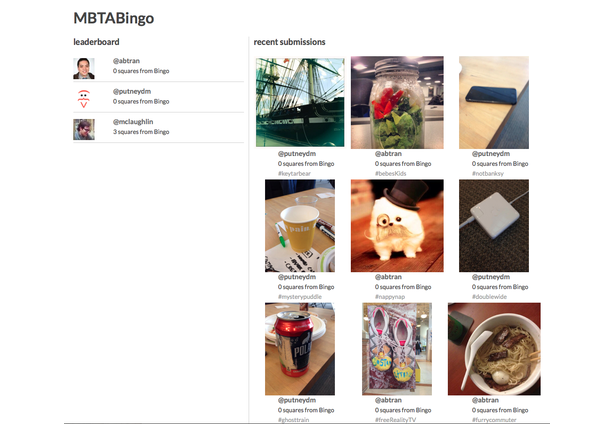 News Bingo is a structured way to get user-submitted photos that have been previously categorized. News coverage topics can be turned into a Twitter Bingo relatively easily. Events, Election campaigns, Concerts, etc. At the bottom of each person's Bingo card online will be links to related news stories. It's a way to get people to play in their own stream with minimal intrusion from a news site. But if they ever get the urge to learn more, they can follow their own card link to dive deeper into journalism. Comments for this submission are closed. View the software in abtran's portfolio to continue the conversation.